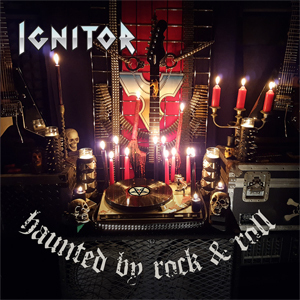 Austin classic Metal crew IGNITOR released their new album Haunted By Rock & Roll on Friday, 11/24 via EMP LABEL GROUP, in conjunction with horror Icon Adam Green’s ArieScope Music. HBRR is the fourth release to feature the renowned Metal vocalist Jason McMaster of DANGEROUS TOYS and WATCHTOWER. The album features 9 new tracks of IGNITOR’s trademark brand of classic NWOBHM inspired Metal, including “To Brave The War”, “No Sanctuary”, and a cover of the RAVEN classic “Hung, Drawn, and Quartered”. The band has released the video for album track “To Brave The War”, which can be viewed on KNAC.COM HERE. Haunted also features “Hatchet (The Ballad Of Victor Crowley)”, the theme to Green’s upcoming VICTOR CROWLEY, the fourth installment in the cult classic HATCHET horror franchise, featuring Kane Hodder reprising his title role as the murderous, swamp-dwelling Victor Crowley. In 2003, former AGONY COLUMN guitarist Stuart "Batlord" Laurence , with guitarist Beverly Barrington, bassist Brendon Bigelow, and drummer Pat Doyle, set out to start a Classic Metal band. After a surprisingly short search, vocal powerhouse Erika Tandy was recruited, and IGNITOR was born. After releasing Road Of Bones in 2005, and the departure of vocalist Erika Tandy, IGNITOR soldiered on, writing and recording their next full-length release, The Spider Queen, while searching far and wide for a new vocalist. Enter Texas metal legend Jason McMaster of WATCHTOWER and DANGEROUS TOYS, who offered to lend his legendary vocal talents to the new album. And just like that, IGNITOR was back in business. With Jason at the helm (and mic), IGNITOR released The Spider Queen in 2009, followed by Year Of The Metal Tiger in 2012, and metal tribute album Mix Tape '85 in 2013.